On Monday morning November 19, 1928, THE NEW YORK TIMES appeared on the news stand, none of the headlines indicated that cultural history had been made the night before. 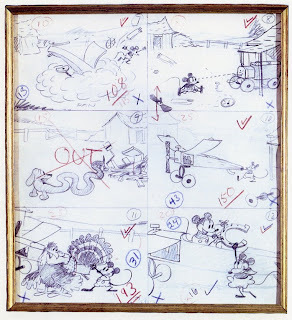 Buried amongst the reviews for new films on page 16, is a small paragraph that mentions the name of a man named Walter Disney and a new cartoon character named MICK(E)Y MOUSE . The Great Depression was barely a year away from starting, and that mouse and his owner would soon shine a light of hope and joy during the dark years ahead. 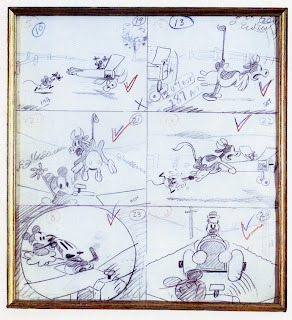 Eighty years on not much has changed and another difficult time is upon us, but at least we still have the mouse and his friends, HAPPY BIRTHDAY MICKEY. 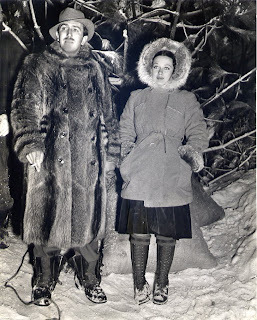 "CHILLY VISIT - Walt Disney all garbed in furs and galoshes, found the weather chilly when he visited with Patricia Morison, young Paramount actress, on the winter location set of 'Untamed', Technicolor drama of the north woods. Miss Morison plays the feminine lead opposite Ray Milland and Akim Tamiroff." I just had to write about this historic day, and am inspired by Didier's blog of two days ago. Obama's win is America at it's finest, democracy in it's truest sense where anyone can rise to the top. With all the things happening in the world today we all need to see that hope. For me this is a defining moment in American history if not world history, as important as the war of independence and the end of slavery during the American Civil War. It puts a lump in my throat to be able to witness the tears of joy among African-Americans live on TV, this is their day, and we on the other side of the world are the privileged spectators. 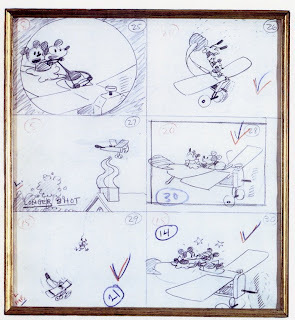 Back in late 1997 I bought a great drawing from PLANE CRAZY the actual first MICKEY MOUSE cartoon. 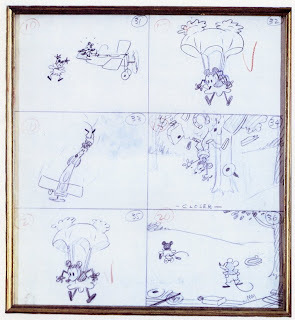 At the time, the gallery I was dealing with in New York was also selling the PLANE CRAZY 'storyboard' pages (storyboards were not really used until about 1932, but these pages are a precursor) on behalf of the Museum of Cartoon Art which was trying to raise funds to complete construction of the museum itself. The $3.75 million price tag was a little beyond my reach, but I was lucky enough to be sent a prospectus. 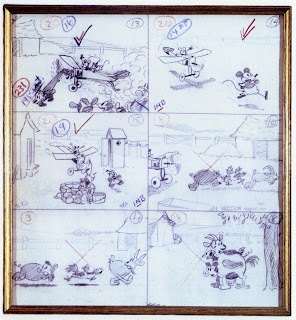 The pages are drawn by Ub Iwerks and were originally found amongst the papers of THREE LITTLE PIGS director Burt Gillette. 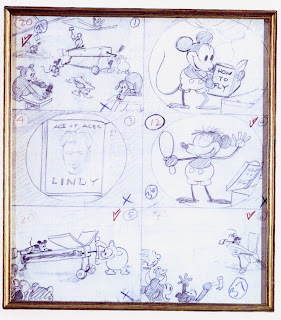 With the 80th birthday of the world's most famous mouse fast approaching, I hope enjoy this glimpse into his origin.